All three weekend performances will take place at Music Hall. The Cincinnati Pops will perform John Williams' Oscar-winning soundtrack during a screening of "Star Wars: Episode IV – A New Hope," the first "Star Wars" film from 1977. Tickets go on sale at 10 a.m. today, Friday May 4. John Morris Russell will conduct three performances of "Star Wars: A New Hope In Concert" -- one at 7 p.m. Friday, Sept. 7; another 7 p.m. Saturday, Sept. 8; and the last at 2 p.m. Sunday, Sept. 9 -- all at Music Hall. Tickets start at $25 and can be purchased online at cincinnatisymphony.org, or by calling the box office at 513-381-3300, says Diana M. Lara, Cincinnati Symphony Orchestra communications director. This is part of the "Star Wars: Film Concert Series" licensed by Disney Concerts in association with 20th Century Fox and Warner/Chappell Music. CINCINNATI -- The Cincinnati Pops Orchestra will present the "Star Wars: A New Hope In Concert" featuring screenings of the complete film with Oscar®-winning composer John Williams’ musical score performed live with the film on September 7, 8 and 9 2018 at Cincinnati Music Hall. The three performances will be led by Cincinnati Pops conductor John Morris Russell. Since the release of the first "Star Wars" movie nearly 40 years ago, the Star Wars saga has had a seismic impact on both cinema and culture, inspiring audiences around the world with its mythic storytelling, captivating characters, groundbreaking special effects and iconic musical scores composed by Williams. Mr. Williams, a legendary composer, is well known for scoring all eight of the "Star Wars" saga films to date, beginning with 1977’s "Star Wars: A New Hope" for which he earned an Academy Award® for Best Original Score. His scores for "The Empire Strikes Back," "Return of the Jedi," "Star Wars: The Force Awakens" and most recently "Star Wars: The Last Jedi" were each nominated for Best Original Score. Mr. Williams has won five Academy Awards, four Golden Globe Awards, seven British Academy Film Awards, five Emmy Awards and 23 Grammy Awards. With 51 Academy Award nominations, Williams is the Academy’s most nominated living person and the second most-nominated individual in history, after Walt Disney. In 2005, the American Film Institute selected Williams' score to 1977's" Star Wars: A New Hope" as the greatest American film score of all time. The soundtrack to "A New Hope" also was preserved by the Library of Congress in the National Recording Registry, for being "culturally, historically, or aesthetically significant." Mr. Williams was inducted into the Hollywood Bowl's Hall of Fame in 2000, and he received the Kennedy Center Honors in 2004, the National Medal of Arts in 2009, and the AFI Life Achievement Award in 2016. Williams has composed the scores for eight of the top 20 highest-grossing films at the U.S. box office (adjusted for inflation). The "Star Wars: Film Concert Series" is produced under license by Disney Concerts in association with 20th Century Fox and Warner/Chappell Music. Disney Concerts is the concert production and licensing division of Disney Music Group, the music arm of The Walt Disney Company. Disney Concerts produces concerts and tours, and licenses Disney music and visual content to symphony orchestras and presenters on a worldwide basis. Disney Concerts’ concert packages include a variety of formats, such as “live to picture” film concerts and themed instrumental and vocal compilation concerts, and range from instrumental-only symphonic performances to multimedia productions featuring live vocalists and choir. Current titles include the "Star Wars Film Concert Series (Episodes IV-VII)," "Beauty and the Beast," "The Little Mermaid," "Fantasia," "Pixar In Concert," "The Nightmare Before Christmas," "Alice In Wonderland," "Frozen," "Ratatouille," "The Pirates of the Caribbean" series (Episodes I-IV), and "Silly Symphonies," which last year collectively accounted for over 400 performances in many of the world’s top concert venues, including Lincoln Center, Royal Albert Hall, Sydney Opera House, Tokyo Forum and the Hollywood Bowl. Numerous new concert packages and touring productions from Disney’s portfolio of studios, including Disney’s feature animation and live action studios, Pixar, Lucasfilm and Marvel, are currently in development. Set 30 years after "Star Wars: The Phantom Menace," "Star Wars: A New Hope," the fourth episode of the saga, returns to the desert planet of Tatooine. A young Luke Skywalker (Mark Hamill) begins to discover his destiny when, searching for a lost droid, he is saved by reclusive Jedi Obi-Wan Kenobi (Alec Guinness). A civil war rages in the galaxy, and Rebel forces struggle against the evil Galactic Empire, Luke and Obi-Wan enlist the aid of hotshot pilot, Han Solo (Harrison Ford). Joined by the quirky droid duo R2-D2 and C-3PO, the unlikely team sets out to rescue Rebel leader Princess Leia (Carrie Fisher) and make use of the stolen plans to destroy the Empire's ultimate weapon. A remarkable artist with boundless enthusiasm for music-making of all kinds, John Morris Russell is a modern conductor who engages and enthralls audiences with the full breadth of the orchestral experience. Conductor of the Cincinnati Pops since 2011, Mr. Russell’s diverse programming and electric stage presence have infused new creativity and energy into one of the world’s most iconic orchestras. The Pops has released four celebrated commercial recordings so far during his tenure and introduced the American Soundscapes online video series, reaching a global audience of nearly half a million. Mr. Russell has also led the Pops on tours to Florida in 2014 and Asia in 2017.
since 2015. A popular guest conductor throughout the United States and Canada, he also holds the title of Conductor Laureate with the Windsor Symphony Orchestra in Ontario, Canada, where he served as Music Director for eleven years. 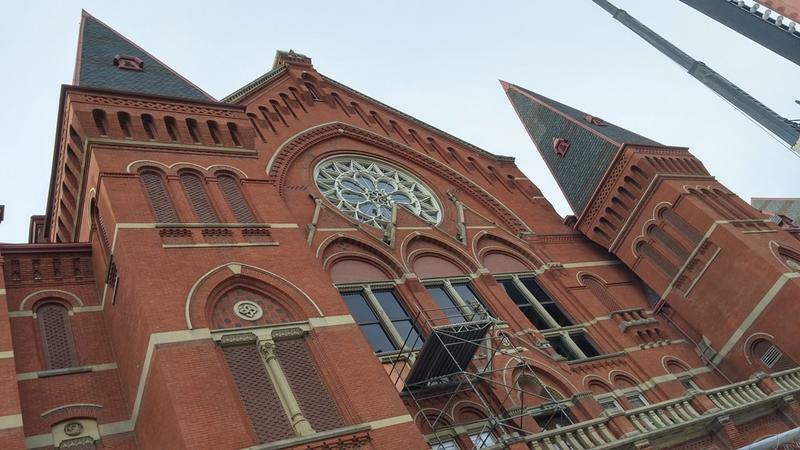 With the Cincinnati Pops, Mr. Russell regularly leads sold-out performances at Cincinnati’s Music Hall. Additionally, he conducts the Pops at the Riverbend Music Center and in concerts throughout the Greater Cincinnati region and on tour. He also often leads the annual Classical Roots performances with the Cincinnati Symphony Orchestra. Mr. Russell has collaborated with generations of great performers including the late Ray Charles and Rosemary Clooney, as well as Idina Menzel, Vince Gill, Branford Marsalis, Brian Stokes Mitchell, Megan Hilty, Common, Cynthia Erivo, Amy Grant, Brian Wilson, Steve Martin, Katharine McPhee, Rhiannon Giddens, Rosanne Cash and Marvin Winans, among many others. A sought-after guest conductor across the continent, Mr. Russell has conducted the Los Angeles Philharmonic at the Hollywood Bowl. Other recent engagements include the New York Philharmonic, Toronto Symphony Orchestra, The Cleveland Orchestra and Vancouver Symphony Orchestra, among many other ensembles. The Cincinnati Pops, which also performs as the Cincinnati Symphony Orchestra, is under the direction of John Morris Russell and presents a diverse array of musical styles, all bathed in the world-renowned “Cincinnati Sound.” The Pops was officially founded in 1977 with the late Erich Kunzel, and just since 1980, the Orchestra has sold ten million recordings around the globe. John Williams, Idina Menzel, Smokey Robinson, Rosemary Clooney, Mandy Patinkin, Arturo Sandoval, Peter Frampton, Boyz II Men, Bernadette Peters, Lea Salonga, Rhiannon Giddens, Megan Hilty, Rosanne Cash, and the Mormon Tabernacle Choir. The Pops tours nationally and internationally, most recently in Shanghai and Taiwan for acclaimed performances in March 2017 and Florida for Holiday season performances in December 2014. The Pops traveled to Beijing as part of the Opening Festivities of the 2008 Summer Olympic Games, and in 2005, the Pops completed a historical tour to China and Singapore performing in the Great Hall of the People in Beijing. The Cincinnati Pops was the first U.S. Pops orchestra to perform in China, and also has appeared to enthusiastic audiences in New York’s Carnegie Hall, in Washington D.C., and Japan. An estimated 30 million people have viewed national telecasts of the Cincinnati Pops on PBS, and the Orchestra has more than 100 available recordings, 55 of which have appeared on the Billboard charts, a record unmatched by any other orchestra. The Pops’ "Copland: Music of America" won a Grammy in 1997, and four other Pops recordings have been nominated for Grammy Awards. In 2012, the Pops released its first recording under John Morris Russell, "Home for the Holidays," on the Orchestra’s own Fanfare Cincinnati label. Subsequent recordings "Superheroes!" and "Carnival of the Animals" reached #8 and #15, respectively, on the Billboard charts. The most recent Pops release, American Originals, received national critical and widespread acclaim for its reimagining of the Stephen Foster songbook. In the spring of 2016, the Pops unveiled "American Soundscapes," an online video series that features Pops performances captured live that has already reached nearly half a million viewers around the world.